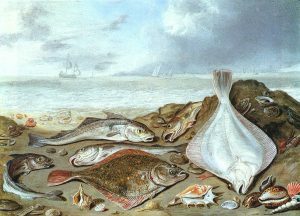 Example of a demersal catch, painted in the 17th century. 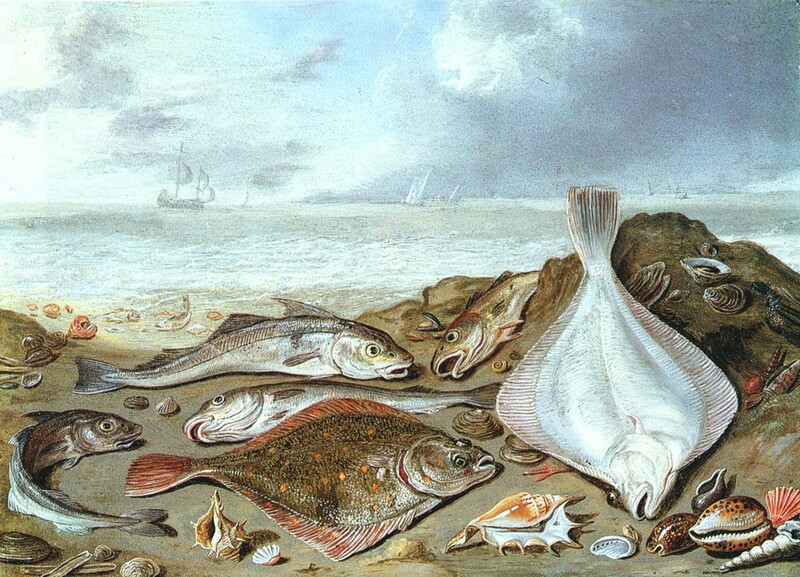 Nature morte de poissons au bord d’un ravage by Jan van Kessel the Elder, Source: Wikimedia Commons. From the Latin verb demergere, meaning ‘to sink’, demersal describes fish that live on or just above the ocean or lake floor. It can also refer to a commercial fishery for groundfish and shellfish, which typically uses gear that is weighted so it sinks to the bottom. Demersal fish are frequently captured by a trawl net that drags along the ocean or lake floor. As a result, demersal fisheries tend to be less discriminate than pelagic fishing methods such as long lines or gill nets that target fish using specific bait, specialized hooks, or mesh size. Bycatch can be an issue for demersal fisheries, but trawl net modifications using Bycatch Reduction Devices (BRD) help to increase capture of target species and reduce unintended catch. Examples of demersal fish species are cod, haddock, and flatfish such as turbot and halibut. Popular shellfish include crab, shrimp, and lobster.